Q: I teach at a college in the extremely Deep South — think swamps and alligators. I'm pretty happy with my general look, jeans or slacks with a woven button-up and a tie. 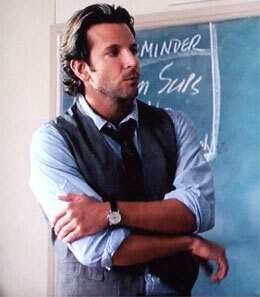 Dress here is pretty casual; I think I'm the only faculty member who wears a tie. So, any suggestions on adding some variety to my look? Blazers or sweaters would be the solution, but it's too hot for any kind of jacket at least 8 months out of the year here. A: While actually wearing a blazer in the blazing heat might not be an option, have you considered simply carrying one? If your arms are already full, consider a vest. While we're not on record endorsing vests — except for down-filled puffy ones — there is strong visual evidence that it works well for an educator like yourself. Even if you don't look like Bradley Cooper, a vest would offer the variety you are looking for, mixing textures and patterns with your ties and wovens. As usual, try YOOX for a bunch of options. Let us know how it works out ... and keep that watch 40mm or smaller like Cooper does here!